A periwinkle blooming in a bed of green, the trickle of a crystal rivulet through the ferns, a lonely bedsit in London with a mouse for company. 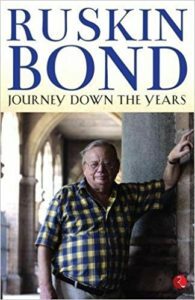 Over the years readers have come to associate these things with Ruskin Bond. Now in his 83rd year Bond opens up his life a little more expanding on what readers already new. The anecdotes in Journey Down the Years are actually memoirs, reminiscences of the past. Many of them are fresh and are like re-experiencing the Bond magic all over again instead of riffling through the old familiar too many times loved stories. Looking for Sherlock Holmes in Limehouse or searching for Dickens, leaning against a storm in Jersey. Bond mixes real life with natural adventures. His are stories of the Himalayan Wind which tugs at his heart or a journey to Haridwar. How the washer boy who one might think lived an idyllic life in the hills near Haridwar wants to get away to live in a smart city regardless of how many more dishes he would have to wash in a place like Delhi. Or how a Minister’s wife was found dead in a hotel room – no speculations as to which Minister that was. Bond has an eye for detail whether in the city or the country, though he prefers to get away from urban jungles and watch old ladies climbing walnut trees. Over sixty years of writing cannot wither his style or custom stale his infinite variety, which may be pushing it a bit. His inspiration continues to lie in his youth and in the days when he was a young man writing Room on the Roof. Most writers tend to outgrow their early influences but Bond continues to revisit them and make them sound fresh. He was born into a country wisdom which went side by side with a love for the hills where he was born. In that sense he identifies himself with Kipling, not Indian born but of the country and a person with a gift for friendship, abandoning his mother and life in England for the friends he made and the natural beauty that inspired him. In a sense Uncle Ken and his grandmother remained far more real than anything else – the lonely room in London or tube stations only served to remind him of encounters with bears in the Himalayas. Bond also reveals his in-depth knowledge of Indian mythology – Kama’s bow and parrot steeds and Krishna’s exploits in Mathura and Brindaban, not to mention Ganga’s coming to earth over the ashes of the death. In a sense he is a pilgrim through this world too. The collection is a potpourri – a mix of memoir, travelogues and encounters with nature presumably coming from delvings through Bond’s diaries. The separate strands come together to form an inspiration collective which will be vital for Bond scholars at some point in time. For Bond fans of course the book is a rejuvenating voyage through well-loved terrain with the pipeline promising more to come – an autobiography for instance soon expected. At eighty three the grand young man still has the capacity to surprise.